That the heaviest of terrestrial mammals had a propensity to damage trees has been recorded since ancient times. The stripping of bark from trees by elephants is a common metaphor in Tamil poetry from the Sangam period (first to fifth centuries a.d.) of southern India. A twelfth century a.d. inscription from central India records that the elephant-headed god (and hence the elephant itself) revels in the sport of uprooting large numbers of trees. Early European travelers in Africa observed that elephants were prone to strip bark and flatten an entire forest. While some accounts are nonspecific about the kinds of trees and shrubs damaged by elephants, others refer more specifically to plants such as acacias being favorite targets. 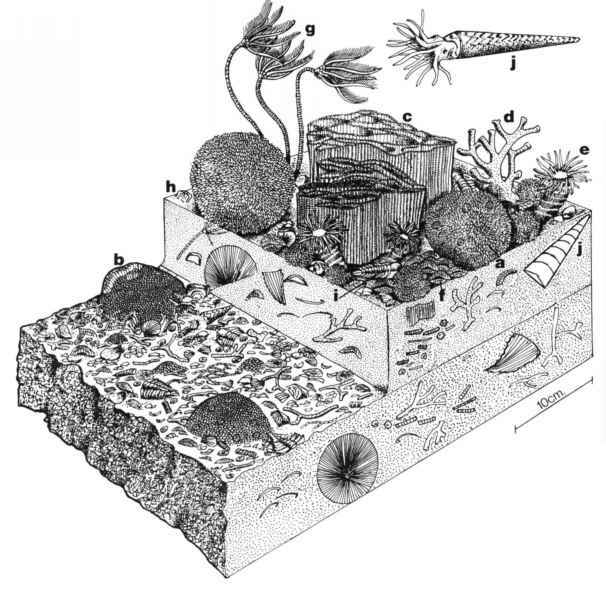 Scientific accounts of elephant damage to vegetation emerged during the 1960s. Comparing aerial photographs of Murchison (Kabalega) Falls National Park in Uganda taken in 1932 and again in 1956, Hal Buechner and H. C. Dawkins estimated in a 1961 publication that the tree population in the park had roughly halved during this period. There was, however, considerable spatial variation in the extent of decline of trees. The work at Murchison Falls was carried forward by Richard Laws and his team. Based on aerial photographic transects in areas of significant habitat change, they observed that densities of trees and bushes were low inside the park, but much higher outside. Often, an abrupt change in vegetation density coincided with the park boundary. In the southern part of the park, the pattern of damage showed a progressive radial increase in tree cover and variety away from the foci of elephant concentrations. A 15-km cross section of such a zone showed that 95% of Terminalia glaucescens, one of the worst-affected species, were dead in the north, where elephant densities were highest, reducing to only 2% dead in the south, where elephant densities were lowest (table 6.1). Combretum binderanum was another tree that suffered considerable damage from bark stripping. Other studies in East Africa also reported on similar patterns of damage. 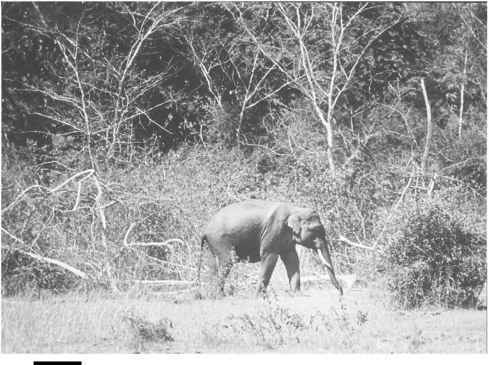 C. R. Field, who studied elephants in the Queen Elizabeth (Rwenzori) National Park in Uganda, found that trees had declined at an annual rate of 14.6% during 1954-1968. The famous Serengeti National Park in Tanzania also had an elephant problem. In 1967, Hugh Lamprey and his associates reported two studies, one describing damage to Acacia and Commiphora woodland in the northern Serengeti and the other concerning destruction of the fever tree Acacia xanthophloea by bull elephants in the Seronera area to the south. Elephants had been absent in the Serengeti prior to about 1955, when they were first recorded here. Their population increased to about 2,000 individuals over the next decade. Consequently, the larger trees were declining at the rate of 6% per year. The Seronera bull problem, as it came to be known in the southern tourist area, was investigated in greater detail by Harvey Croze during 1968-1971. He found conspicuous effects on three acacias: the fever tree Acacia xan-thophloea, the gum arabic A. senegal, and the umbrella acacia A. tortilis. A bull pushed over three trees on average every 4 days. At specific locations, the elephants were removing the canopy acacias at a rate of 6% per year, although the loss of the larger trees was only 2.5% per year over the entire Seronera region. Acacia tortilis was also a prime target for elephants at Lake Manyara National Park during the 1960s, when Iain Douglas-Hamilton recorded a density of 5 elephants/km , one of the highest recorded in African habitats. 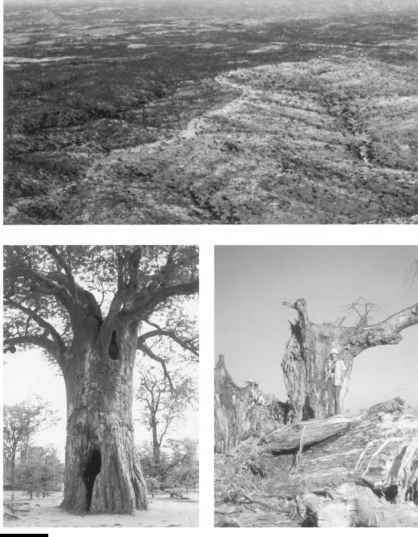 Proportion of adult trees of Terminalia glaucescens scarred or dead in 1967 because of damage by elephants in the Murchison (Kabalega) Falls area of Uganda. Moving to the even drier bushland of Tsavo National Park, R. M. Watson's analysis in 1967 showed that destruction of trees by elephants was uniformly spread over the 20-km long aerial photographic transects. On average, 27% of trees (over 65-cm crown diameter) were killed, equivalent to a 6% annual rate of death following the drought of 1961. Apart from the decline of the Commi-phora-Acacia woodlands, the attractive baobab (Adansonia digitata) tree, once characteristic of Tsavo, had also almost disappeared. The elephant population of Tsavo suffered substantial drought-related mortality during 1970-1971. Following this population reduction, Walter Leuthold conducted ground surveys of four common trees in the park during 1970 and 1974. He found that three of these (Commiphora spp., Acacia tortilis, and Delonix elata) declined substantially in both mature and recruitment-age classes due to browsing by elephants, while a fourth species (Melia volkensii) not utilized by elephants increased slightly. It seemed as if a significant decline in elephant numbers was not sufficient to reduce browsing pressure on palatable trees. In another dry habitat, the Ruaha National Park in Tanzania, a serious impact on Acacia albida and the baobab during the 1960s was first reported by J. M. Savidge. In the larger acacias, damage to bark exposed the tree to attack by borer beetles and eventually it fell. More serious was the heavy localized impact on regeneration, with 94% of stems showing damage by elephants and 55% so severely damaged that permanent deformity or death was certain. The elephant problem at Ruaha was studied in greater detail by Richard Barnes (fig. 6.1). During a survey in 1976, he found that 40% of Acacia albida trees were dead, while 67% of Commiphora ugogensis had been killed over the preceding 6 years, a 17% annual rate of mortality almost entirely due to elephant feeding. The baobab was declining at a 3% annual rate, while recruitment had dropped considerably over the preceding 25 years. Barnes surveyed the baobab population again during 1982 and 1989. Baobab tree density declined considerably between 1976 and 1982, but not significantly by 1989. The poaching of most bull elephants during the latter period could have been the reason for the arrest in tree decline. The size structure of the baobab, however, changed over the period 1976-1989, with a shift to larger sizes and the complete disappearance of the smallest stems (fig. 6.2). A landscape in Zimbabwe (top) where the elephant's impact on the woody vegetation can be clearly seen in the sharp contrast along the boundary of Mana Pools National Park, with fewer trees inside the park. (Photo courtesy of Richard Hoare.) A living baobab tree (bottom left) with the base of its stem hollowed by elephant feeding at Sengwa, Zimbabwe (photo by author), and another baobab (bottom right) reduced to pulp by elephants at Ruaha, Tanzania (photo courtesy of Richard Barnes). would push over trees, Guy calculated that, on average, a male in the Sengwa population might fell 1.6 trees per day. Female elephants pushed over far fewer trees. Still, the estimated 56,000 trees felled each year by the elephant population over a 390-km2 area of the reserve was significant considering that tree recruitment rates were likely to be lower (these were not measured). spermum mopane) woodlands. A Food and Agricultural Organization (FAO) team working there during 1966 estimated that elephants were felling trees at the annual rate of 138 trees/km or 4% of the standing crop (Hanks 1979). A decade and a half later, Dale Lewis, working in South Luangwa, calculated that production of mopane stems was severely restricted by elephant browsing. Elephants also had an impact on succulent thicket rich in endemic plants, as in the Cape Province of South Africa, although this was secondary to feeding by goats. Kruger National Park, home to most of South Africa's elephants, also had a problem of damage to woody vegetation, although this was surprisingly not well documented in the literature as with other regions in Africa. The impact of elephants on woody vegetation is not confined to semiarid Africa. Robert and Martina Hid ft documented the impact of elephants on a coastal rain forest that had previously been logged in Kenya's Shimba hills. They listed nearly a hundred species utilized by elephants. The saplings of several potential canopy and subcanopy trees were browsed by elephants; these constituted 19% and 48% of all browsed species, respectively. Elephants could thus have a major impact on the succession and structure of this moist forest. Transformation of Asian elephant habitats as a result of browsing has not been as dramatic. In a 1971 paper, Dieter Mueller-Dombois described the distortion to young tree crowns caused by elephant utilization in the dry forests of Sri Lanka's (Ceylon's) Ruhuna National Park. As much as 79% of the thorny evergreen tree Feronia limonia showed crown distortion, while other woody plants suffering high levels of damage included Streblus asper (72%), Manilkara hexandra (59%), Elaeodendron glaucum (55%), Salavadora persica (55%), Cordia gharaf (53%), and Randia dumetorum (53%). Of 62 species recorded, 17 others were affected to the extent of 25%-50% of stems scored in the survey. Elephants preferentially utilized secondary growth forest to the near-climax seasonal forest. In spite of a large proportion of woody species being damaged to significant degrees by elephants, Mueller-Dombois did not express any concern about a transition from forest to grassland at the existing elephant densities. One reason was that hardly any tree was pushed over or had its bark damaged adversely; the very low numbers of tusked elephants here contributed to this pattern. Working in Gal Oya, another part of the Sri Lankan elephant's dry zone range, Natarajan Ishwaran also recorded a large number of woody plants browsed on by elephants. However, most (78%) of the damage consisted of breaking or twisting of branches and stems, with only 8% of observed damage being partial or complete pushing over of trees. Crown distortion also was uncommon and restricted to a few species, such as Bauhinia racemosa. Thus, there have been no real concerns of a decline in woody vegetation because of elephants in the Sri Lankan dry habitat. Similar patterns of woody plant utilization by elephants are also seen in the dry thorn forests of southern India. However, it is mainly in the deciduous forests that significant declines of certain tree species can be directly attributed to elephants. During the early 1980s, I observed in the Biligirirangan hills that malvaceous trees and shrubs such as Grewia tiliaefolia, Kydia calycina, Eriolaena quinquelocularis, and Helicteres isora suffered a high degree of damage from bark stripping and branch or stem breaking by elephants. 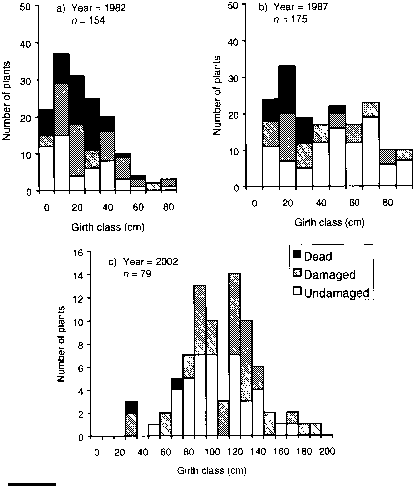 Even though 80% of Kydia and Grewia stems had some degree of damage, less than 15% of stems (>10-cm girth) were dead. In drier habitats, two tree acacias, Acacia suma and Acacia leucophloea, were favorite browse for elephants. There was no evidence for decline of these species. 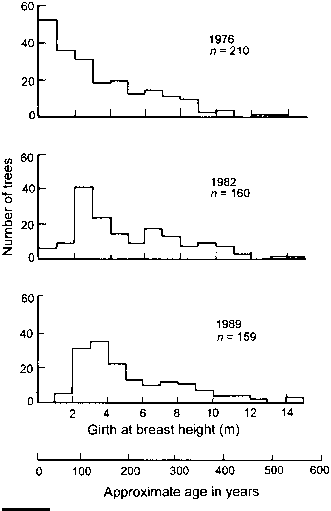 Damage to Acacia suma was very high during 1981 and 1982, but this declined in later years (fig. 6.3). The Acacia suma woodlands are still intact, although a little thinned, two decades after my initial observations. One change in the structure of the woodland is a shift from smaller size to larger stems as these have grown over the years (fig. 6.4). A young Asian bull elephant in an Acacia suma woodland in the Biligirirangans, India. This woodland suffered heavy damage due to elephants breaking stems and stripping bark during 1981-1982, but thereafter much less damage occurred. initial population of 5,175, by 90% to only 525 stems in 1994, and thereafter more gradually to 147 by the year 2000. Damage by elephants has been the main cause of decline. Three other woody plants from the order Malvales have also declined over this period. Helicteres isora, a shrub, and Grewia tiliaefolia, a canopy tree, have declined from a combination of fire and elephant utilization, while Eriolaena quinquelocularis, an understory tree, has lost ground mainly due to the elephant. The demography of these woody species is poorly understood. Changes in population sizes (stems > 1 cm diameter at breast height [1.3 m]) of four woody plants (order Malvales) consumed by elephants in a 50-ha permanent plot at Mudumalai in southern India. No clear pattern of utilization by elephants can be discerned as yet. Long-term monitoring of these populations could provide better insights into the interaction of elephants, fire, and other influences on their dynamics.